This setup uses a single computer with 3x27" flat screen displays and hand controllers. Computer is Intel based i7 4790K CPU @4GHz - 16 Gb RAM - 1Tb SSD (Solid State Drive), nVidia GTX 980 Graphics card - Saitek X65F hand controllers and 2 MFD (Multi Function Displays) either side of the keyboard. I wear the TrackIR head tracking sensor that shows me the scene wherever I am looking as I turn my head. What you see above is the view from the Tornado cockpit over South Wales. I can fly T-33, CF-104G or my old Kiowa recce helicopter any time I want. My interest in Flight Simulation began in the RCAF in 1977 when I attended the Aerospace Systems Course (ASC29) in Winnipeg. That year we visited virtually every aerospace manufacturer of aircraft, weapons, sensors and electronics in the western world. Some showed us their latest flight simulators. From physical models to full motion cockpits of CAE to spherical displays for USAF F-16 fighter training (LEFT) it became apparent in 1977 that high-fidelity flight simulation was already a critical part of all pilot training for both civilian or military. Click small pics on the LEFT to see a 1970s style F-104 Sim used by the Canadian Forces. One with the empty instructor's console is from Grosseto Italy. The 2 right photos are Baden Germany. It had a very REAL feel in the cockpit but pretty crude realism with no motion and no graphics. Below left is my current setup (2016). Again, no motion and it's a desk, not a cockpit, but the cockpit and weather views are realistic enough to put you in the environment and make you feel the stress and thrill of the experience. We've come a long way from that huge console of the CF104 Sim in Baden. I started experimenting with FS98 and Microsoft Flight Sim in 2000 and completed a round the world flight challenge in July 2001. Since 2012 I've tried various personal flight simulator using FSX and the latest P3D software from Lockheed Martin. 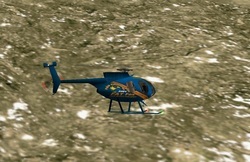 I can fly any aircraft, in a virtual world from any location on earth with the actual weather that is there now. Realism is the key to immersion, when you come to believe you are someplace else. Your own body senses if sight and sound make you believe you are really there . . and in effect you are . . .You get mentally transported to another place and time. Now I get to fly my own Starfighter in it's operational role, in formation with friends all over the world, in the rain and fog and the dark of night . . . the way I always wanted to, . . . but without the risk of immanent death. Below are some examples of what I see in the P3D sim I use now. It's an upgraded version of the original Microsoft Flight Sim 10 . . or FSX. Lockheed Martin bought the basic code and added a ton of improvements. It's now P3D Version 3.1 and has "volumetric fog", great lighting and shadows and much more accurate geography for the entire world. Lots of 3rd party software is available like REX4 for clouds and weather, or FTX Global for detailed MESH (land textures and height) and more detailed trees and buildings that all make the scenes very realistic. Here are some examples of the kind of realism I see now . . and feel when I'm flying. . . in my basement. Screenshots from FSX and P3D. One of if not THE best flight simulation modelers is Sim Skunk Works in Italy. They build and fly multi-aircraft multi-mission operations over EU and the middle east every week. 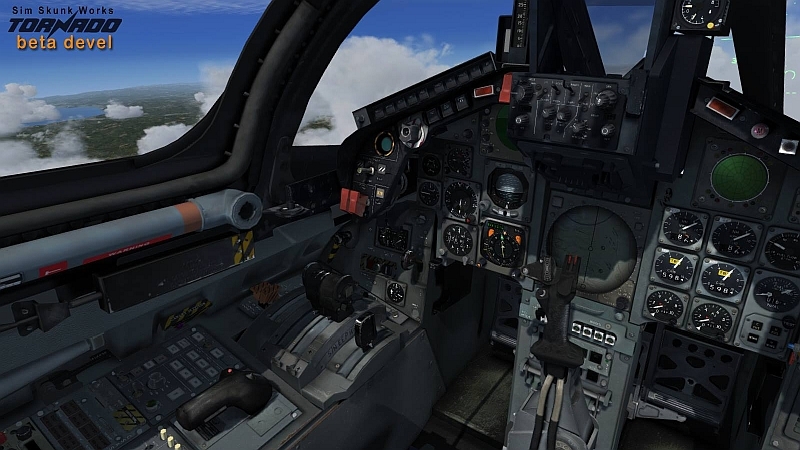 Challenging missions in Cold War scenarios with high fidelity sim models like the F-104 F-85 Harrier Av8B. The 2 crew Tornado pictured above is soon to be release for P3D with TACPAC for multi-player.